Welcome, from your friend in Christ. Did you feel that tug that brought you to our web site? Do you believe that it was not by accident that you are reading this page of our catalog? I can assure you that you are not the first. You see, we have been ordained by God to provide quality, affordable and accessible degree programs to Christians globally with an earnest desire to better serve Him and His flock. Whatever the goal that He planted within you, it is our desire to assist you on that path. There is a need for qualified and knowledgeable servants in His Kingdom, and as an adult learner and using our distance learning methods, you can achieve those goals. Our materials are geared to support you in your daily service and to give you the background needed to build your confidence to face the challenges that this world will offer you. We have had students who are looking to earn a degree quickly. Although we are designed so that you may progress at your own pace, please examine your motives for considering CTS. Students who want to progress rapidly may become disappointed when they find out that the rigor involved in completing the course work is demanding. One day I personally hope to hear the words “Well done good and faithful servant.” It is my job to make sure we keep on the high and narrow path. Our online programs are designed for distance learning, and no residency requirements exist in order for you to earn your degree. Every student is assigned a mentor who will guide them through their program. However, the student should not need to lean too heavily on their mentor. Our studies are course driven, not instructor driven. The adult learner should be able to motivate themselves through the material. At this point, we all must be honest with ourselves. Some students may thrive better in the classroom environment rather than independent study. Most students do just fine, however. The fact is, the founders of CTS and our mentors are all life-long learners and understand completely what you will be going through. This is our niche. Having said this, I know that there is going to be an element of anxiety involved as you start your program. It may be buyer’s remorse. It may be, “Where will I find the time?” “How can I afford this?” All I can say is, “don’t second guess God.” Too many students have earned their degrees before you. You can do it! So, don’t ever give up! The secret is to do a little study each day. Just tell yourself that you will do fifteen minutes of study after the kids go to bed. Just get started. At fifteen minutes you can decide to go a little longer or stop for the evening. But, you will have done something! Please don’t let the fact that we are an independent school, and not affiliated with a denomination, cause you any concern. We are Bible oriented and we have students from all denominations represented. Over sixty percent of our students are already in the ministry. Many students receive reimbursement from their churches or places of employment for attending Colorado Theological Seminary. It has been my privilege and blessing to have been able to communicate with you today. I hope to see your application in the near future and I look forward to accepting you as a student in the program of your choice. 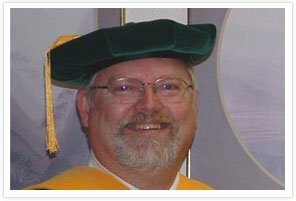 Gary G. Tryzbiak, TH.D., PH.D.